Renault has been selling the official Zoe granny charger for a while. The official name is AFAIK the “Flexi charger”. It retails for a bit over 700 euro’s. Charging current is fixed to 10 amps. Slovenian forum member “pirpy” dissected it (partly) and noticed there is a control wire to the Schuko plug to change the maximum power setting to 13 amps. 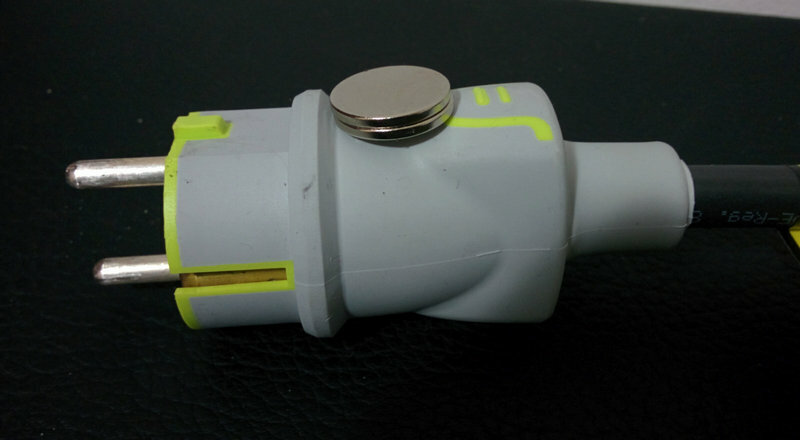 It is done by using a “special socket”, that is coded to supply that current using….. a strong magnet!! See this forum entry and a few posts down. “pirpy” decided to use this knowledge to recode the flexi charger to 13A permanently. In all fairness user “Crf” in the UK SpeakEV forum pointed me to this and I fully admit I thought he was pulling off a pretty decent April 1st joke, but it is really true! Edit: as expected the Flexi charger has two relays so it can switch polarity. That was impossible to do in my granny charger, simply because there was no room for it. Last week my “granny” charger (original Renault) started behaving strangely and stopping charge during the night. After some investigation I finally found out that my socket where “granny” charger is plugged is getting hot. Which means that Renault “granny” charger is very smart and besides reed relay for enabling faster charging also has embedded temperature sensor which detected faulty socket.